Are you in search of a fulfilling job? We’re here to help. 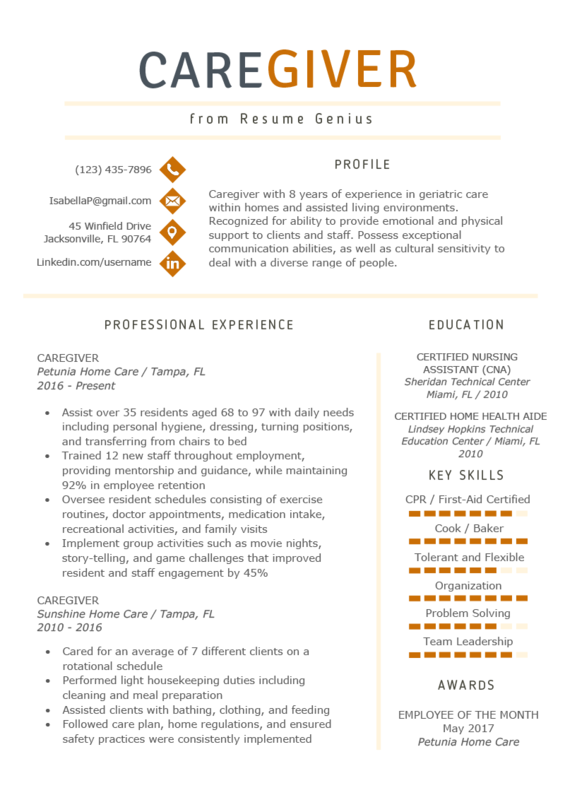 Our caregiver resume sample and job-specific writing tips should be just the ticket to get you working soon with those in need of your assistance. Caregiver with 15 years of experience in geriatric care within homes and assisted living environments. Recognized for ability to monitor and provide emotional and physical support to patients and staff. Possess exceptional communication abilities, as well as cultural sensitivity to deal with diverse population. First and foremost, you should be aware of the types of licenses, certifications, and skills that you should display prominently on your resume. If you don’t have them yet, you should make it a career goal to earn them to boost your ability to both get hired and land a higher salary. In rare cases, a CPR and First Aid training and a TB test are required. 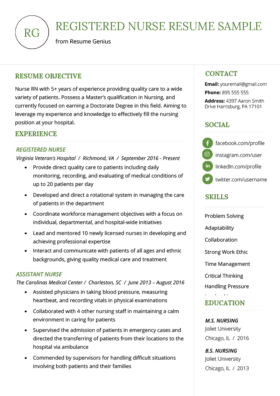 Beyond certifications, what are the major skills you should include on a caregiver resume? It’s important to include these three key caregiver skill areas on your resume. Caregivers are in more demand than ever with our aging population. They are integral in order to provide the necessary care within at-home, assisted living, and nursing homes. Caregivers help clients with their daily needs, as well as provide the much needed emotional support for the often neglected older population. A caregiver is also crucial assistants to medical professionals, ensuring that clients are following proper therapies and taking medications according to prescribed orders. To the greatest extent possible, you need to come up with examples of these traits to show in your resume. Essentially, he’s laid out all of the highlights of his resume in manner that saves the hiring manager quite a bit of time. His introduction quickly convinces the hiring manager that he is a good applicant, and will therefore finish reading the resume. When it comes to resume introductions, choosing the right one can be a bit tricky. Find out how to start your resume to maximize your chances of landing the interview. The content in the Professional Experience section must be used to prove and expand on the claims made in the resume’s introduction. The above bullet point proves that the candidate is innovative and cares about the quality of life that his clients lead. He takes the initiative to ensure that the people under his care are happy. As shown above, the caregiver’s extensive experience in the field has allowed him to be a mentor and leader to newer staff. His high retention rate also means that he is able to ensure that the staff is happy doing their work. If he’s able to assist this many residents, it means he is good at multi-tasking and has exceptional organizational skills. Here, the candidate showed the scope of his work, and what he is capable of handling. If he’s able to assist this many residents, it means he is good at multi-tasking and has exceptional organizational skills. 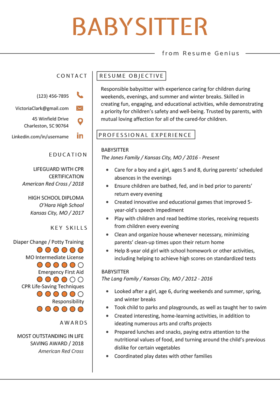 Caregiver applicants must continue to persuade the hiring manager that they are the perfect applicant by using a persuasive and targeted resume, backed up with numbers. Must Read: How to Write a Resume. Make sure to do research on the company you are applying to before writing your resume. It’s important that you address the specific needs of the employer, so if you notice any key words being used in the job advertisement, don’t be shy about putting a few into your resume or cover letter! If the list above is still not enough, be sure to glance through the longest action verb list in the universe if you aren’t satisfied with your choices here. Ready to begin? 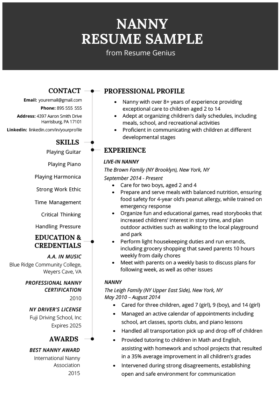 If you need to build your resume quickly, we have a wide array of templates for you to choose from that make the job a piece of cake. Or, you can just use our fast-and-easy resume builder. The choice is yours – best of luck on the job hunt!